On March 28, the Permanent Council of the Organization of American States (OAS) experienced a public spectacle of disarray that, in 36 years of diplomatic life in many international and multinational organizations, I have never witnessed. A similar observation was made by many other seasoned Ambassadors. 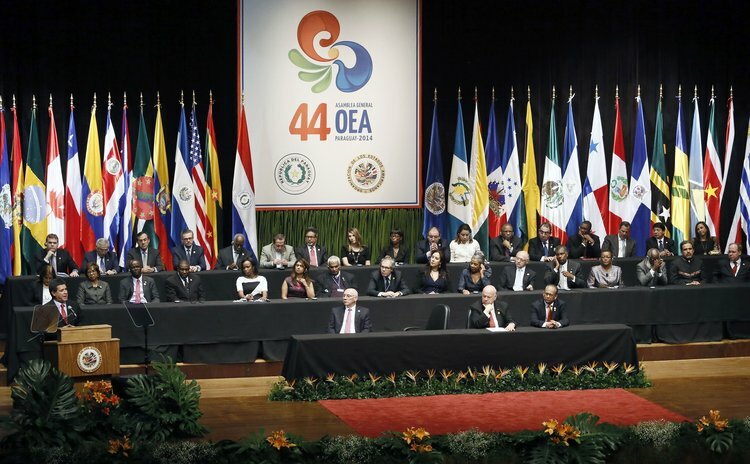 The spectacle, which was a complete breakdown of all the norms of diplomatic discourse, resulted from the dysfunctionality of the OAS; the antiquated nature of its governing Charters; and the long overdue need for a revision of its procedural rules. A highly fractious and contentious public meeting – carried live via an Internet streaming - was brought to a premature end with some delegations on their feet, ready to walk-out; accusations being fired back and forth across a room (named after the great Latin American integrationist, Simon Bolivar); and the Chair of the meeting struggling to retain order. The meeting was preceded by enormous pressure on many of the OAS member states to come down either against or for Venezuela's refusal to allow the meeting to proceed. In the run-up to the meeting US Congressional representatives wrote to governments urging them not to side with Venezuela. Senator Marco Rubio, went somewhat further by warning Haiti, the Dominican Republic and El Salvador that it would be difficult to protect them from possible cuts in US aid if they supported Venezuela. The Venezuelan government also sought to marshal forces, particularly among the countries to which it had provided concessionary financing for oil under Petro Caribe arrangements. In the event, lines were drawn between member states, not helped by toxic remarks and two reports by the Secretary-General of the OAS, Luis Almagro, that many representatives of member states felt had exceeded his authority. His public war with the President of Venezuela, Nicolas Maduro, in language (by both of them) reminiscent of domestic political hustings, had not helped to heal divisions between member states or to create an atmosphere for constructive dialogue – a role, which every Secretary-General of every international or multinational body, is expected to play. Venezuela opposed the request by the group of 18 countries for a meeting at which the situation in the country would be discussed. It based its objection on Article 1 of the OAS Charter which states that the OAS "has no power other than those expressly conferred upon it by this Charter, none of whose provisions authorizes it to intervene in matters that are within the internal jurisdiction of the Member States". However, the Permanent Council was compelled to rely on the only available legal Opinion as to whether Article 1 did indeed prohibit discussion of Venezuela without the permission of the government. That legal Opinion came from the chief legal officer of the OAS Secretariat who answers to the Secretary-General, and while his Opinion might be perfectly correct, it was doubted by member states during the meeting, giving rise to uncertainty about whether the Council was proceeding on a sound legal footing or in violation of the Charter. For the third time in 18 months, I drew attention to this fundamental problem by saying: "We proposed to the Permanent Council that it would be more appropriate for this Council to commission three distinguished jurists drawn from member states to offer Opinions from which the Council could accept the two that are closest to each other. We remain convinced that this should be the way we deal with legal Opinions in the future. There should never be any doubt about the legal basis for our actions as there is now". This matter points to the need to review the Charter which was written at a different time in international relations – a time when governments were less concerned about the internal affairs of other states, and when the risk of contagion and harmful effects lacked the bite that they have today, including refugees, break down in security and humanitarian crises that become a burden on neighbouring states. There should be absolute clarity on whether any member state can prohibit a discussion of its circumstances should a majority of others – and evidence – suggest that a discussion is warranted. And, legal Opinions, if they are necessary should come from objective and neutral jurists. Further, in today's international reality of humanitarian crises, cross border contagion and a widespread global desire for stability within states, every governing charter of all organizations, including the United Nations, should be reviewed to allow for assessments of situations in member states if there is sufficient concern by a majority of other member states and evidence of a break down in democracy and the rule of law, or of a humanitarian crisis. Indeed, if the OAS Charter provided for such an evidence-based assessment, its member states would be constrained to stick to the rules in the full knowledge that if they are broken, a majority of other countries would have the right to inquire into their situation. I made the suggestion for: "The appointment of a Commission to review the OAS Charter, including the establishment of objective machinery which would determine if there are good reasons for addressing stresses on democracy, the rule of law and human rights in a member state". And I made the point that the proposal was not inventing the wheel since similar machinery exists in the Commonwealth of Nations for its 51 member states, and the role of the machinery – a representative committee of ministers – is not be to be punitive, but to be helpful through a series of engagements. Only when such engagements have been exhausted is suspension contemplated. The OAS is an ailing organization. Its charter is not relevant to its time; its procedures are ill defined and the lines of authority, particularly between the Permanent Council and the Secretary-General are unclear; and it is starved of the financial resources it needs.